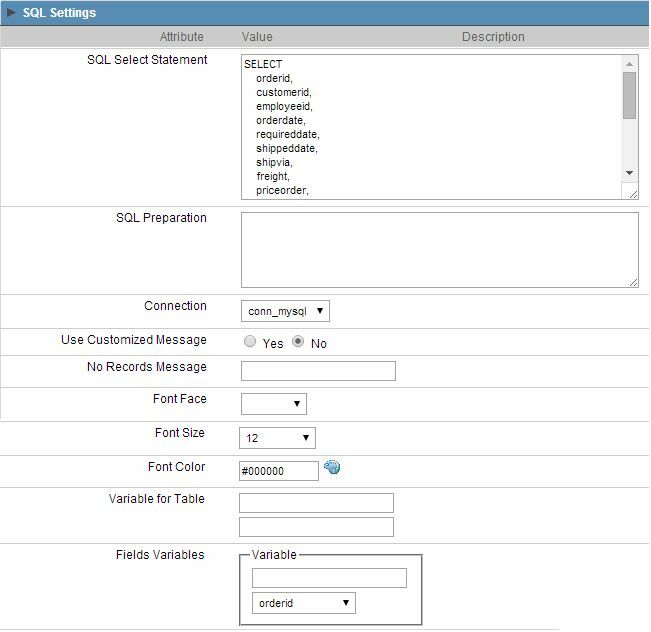 SQL Select Statement - Displays the SQL select command. Tip: The user can use the SQL Builder for fast assembly of the command. SQL Preparation - Enter the SQL commands or procedure names to be executed before the application main select. Connection - Shows the connection name (database) that the application is using, this connection can be changed for another that has the same tables (SQL). Use Customized Message - Allows defining the message to be shown if the grid do not return a record (EOF). No Records Message - Message to be shown. Field associated to “Use Customized Message”. Font Face - Font name used, click on the icon and choose a font. Field associated to “Use Customized Message”. Font Size - Choose the font size. Field associated to “Use Customized Message”. Font color - Font color. Field associated to “Use Customized Message”. Variable for table - Table name variable. Note: In the first field should be filled with the variable name. The second field must be filled with part of the table name to be replaced. Fields Variables - Variable to replace select field name. Note: In the first field must be filled in the name of the variable in the second field should be selected the name of the field to be replaced.